Designed by Jody Kinney of Dublin, Ohio, Lafayette covers 250 acres, and takes advantage of the varied terrain and the many lakes and rivers on the historic Green Farm property. 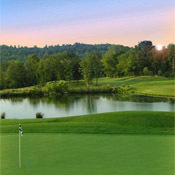 Opened in May of 1997, the course offers superior golf for all levels of play. Four tees on each hole vary the course from 4200 yards to 6900 yards with the layout design incorporating both links and wooded styles. Lush bermuda fairways and bentgrass greens are surrounded by Kentucky bluegrass rough. Lafayette was awarded the # 2 ranking in Golf Digests Best in State rankings for 2005-2006 in the state of Kentucky. Lafayette was recently named 4-star best courses to play 2006-2007 by Golf Digest. Yet we suggest you come visit us and find out for yourself! Upon arrival at our facility, the staff of Lafayette Golf Club will strive to provide the highest quality of service. The Cart Attendants, Starters, Rangers, Pro Shop Attendants and Golf Professionals are there to see that you have an incredible & memorable day of golf.